Last year, James Quarles walked into an unexpected interaction with a dad from his kids' elementary school. Running late to an evening event for parents, he was greeted by another father who knew that Quarles worked at Instagram. "Man, you just … get me," the guy said. Quarles wasn’t following. "The ads you're running are ridiculous — you know exactly what I like, what I'm interested in — everything." Quarles smiled, "Well then, I guess my job is done." At the time, he was leading the team that built Instagram's in-feed advertising — designed to be so relevant to users' needs and wants that it could add real value to their lives. And here was more evidence that it was doing exactly that. In a short amount of time, Quarles led the combined Facebook and Instagram team that built a multi-billion dollar business for the company, amassing expertise in what it takes to connect a beloved product to authentic and effective monetization. This is something that many startups grapple with as they grow up — and it's among the hardest challenges they have to overcome. They're encouraged to wait. Many startups are so focused on growing their product that they fear monetization will hamper growth, so they de-prioritize it. Once they do turn their attention in that direction, they’re often under pressure from VCs and their board. Finding product-market-fit for monetization can take as long as the core experience. Short-cutting the strategy and experimentation can be a recipe for disaster. Easy money often compromises the brand or user experience. There are many “get rich quick” schemes out there, from inserting low quality programmatic ads to selling background data or email addresses to third parties. But doing so can breach user trust, create regulatory challenges and meaningfully degrade the core experience. Winner takes all — all too often. Startups become enamored with other companies’ business models and believe their product lends itself to the same playbook. But monetization models are slowly becoming winner-takes-all propositions. Digital advertising and mobile commerce fall into this bucket. It's nearly impossible to garner attention if you're not in the top 5 companies in your field. This reality leaves many startups casting about for a business model that'll work quickly, and when they fail, the miss is costly. Quarles has witnessed this again and again, and wants to offer another way to monetize thoughtfully and authentically. He has the pedigree to back up his recommendations, too. He joined Instagram’s co-founders to help introduce ads in a measured way into their feed and Stories. Today, he's CEO of fitness juggernaut Strava, pursuing different business models — yet applying similar principles. Under his stewardship, they're augmenting their subscription and insights business lines that the founders built in a way that's intended to make the community stronger. In this exclusive interview, Quarles shares what he's learned about creating business models that connect seamlessly with the technology products they depend on. His hope is that what he's learned at both Instagram and Strava can help other startups figure out how to make money in the best way for them. Panic begets bad decision-making. The decisions startup founders make when they're under the gun from investors to figure out revenue are seldom good ones. When they hear from their board that they need to make money, or head into a next funding round, they grasp for monetization options. The hasty implementation that results is low-quality — the product of short-term thinking — compromising user trust and experience, and prompting huge churn. In contrast, Strava’s founders launched their subscriptions business, named Premium, within six months of opening the app’s beta period in 2009. They communicated the intent to do so from the earliest days and have been refining the offering over many years. With time to learn the combination of features people love, they built a high-retention business alongside a fast-growing global community. They weren’t choosing between growth and monetization, they developed the two together. Monetization isn't enmeshed with the product. The best business models are deeply and authentically integrated into the product experience, and play to its strengths. A lot of startups hire a sales leader who has specific domain expertise, and who therefore limits exploration into all the different ways the product could support revenue. Companies should look inside first and resist a “copy-paste” mentality. Instagram’s three foundational company values created a very natural and differentiating proposition for prospective advertisers. Brands and small businesses are looking to align with people’s passions, like travel, sport, fashion and food, and can do so through relevant and compelling visuals in Instagram’s very personalized feed. The best way to kick off a monetization plan is to sit down with your entire leadership and identify your product's current super powers. What do you do better than almost everyone else? What are your unfair advantages? Ubiquity: It has forged partnerships with all the major device manufacturers (think Garmin, Fitbit, Apple Watch) and has more than 30,000 API partners, making its platform a significant and central powerhouse. Aggregations: The ability to make the data it collects meaningful and motivating to people. Employees who are active themselves and prioritize empathy for the app's athletic users. As you'll see below, Strava has applied all four of these powers into revenue opportunities over its history. Quarles recommends that all startups take the time to tally their distinct advantages as a basis for a sustainable business. Another mistake is that they're not realistic about how users behave or how businesses make decisions. There are a few ways this manifests. A lot of companies 'wishcast' (in Quarles words) — they anticipate and design for behaviors that real life users just don't exhibit. While many companies are defining and training new behaviors for consumers, too many others are depending on a step-change function in people's willingness to do or buy things. For example, Quarles has seen ads for $6,000 watches, $2,000 bicycles and $800 mattresses on certain apps. Very few people make this size of purchase on their phones. It’s more likely that those ads will plant a seed that someone will research further as they get closer to time of purchase. Accordingly, that app’s experience shouldn’t push to “buy now” — it’s much more effective to just capture that a person is interested and invite them into the next stage of exploration (either in store or via online reviews). To successfully monetize, you have to be realistic about the actions people will take. If a company decides advertising is their primary money-driver, they need the make it easy for agencies to engage with them — but many opt for bespoke or atypical advertising formats. This comes down to technicalities like aspect ratio or geo-filters that require an entirely different creative agency. How do most advertisers format their creative? Find out and use that format. Don't try to be clever or cute. Don't inadvertently narrow your field with weird and unnecessary specifications to work with you or else you’ll always sit in the dreaded “experimental” category of a company’s budget. It’s also important to ensure congruence between the business department you’re supporting with your product and how their budgets work. In the early days of social and messaging apps, many companies built a highly efficient customer service proposition to respond to questions faster than those businesses’ other contact channels (phone or email). Think of all the questions pointed at Twitter handles and Messenger bots. Those social sites then tried to convince the customer service departments to buy advertising in support of the app’s business model which was entirely inconsistent with how those support teams budget and pay (traditionally licensing software per seat or paying consultants). Unsurprisingly both parties became extremely frustrated with the lack of product — budget fit. Finally, it's common for companies to inappropriately size and prioritize their best opportunities. There's also a lot of wishful thinking involved here too. They want to make money a certain way, and therefore apply too much optimism into the financial assumptions for their favorite path as opposed to evaluating all options consistently. It’s far better to establish conservative and more optimistic ranges for each alternative and then determine what you have to believe for each case, applying skepticism uniformly. It’s great preparation, as that’s exactly how your next round of investors will evaluate your new business lines. Now that you know the most common traps entrepreneurs fall into, you can proactively avoid them. But that's only half of the equation. Now you need to follow the 4 steps that produce successful business models for most consumer-facing companies. 1. Find the intersections of business and community value. For any startup looking to monetize, this is a vital exercise to conduct. First, talk to end users and super users (qualitative interviews, get a good cross-section) about the value your product provides. How does it fit into their lives? What are they trying to do more generally to achieve their goals? How is your product helping them with that (if at all)? Second, talk to the businesses that are present on your platform or interested in helping you monetize. What are their needs? What image do they want to project? What do they need to appeal to more people? You want to analyze motivations of both audiences to get to the root of what they need to succeed in their work, and in their lives. The 5 Whys will come in handy for this says Quarles. After every response you get to these questions, ask 'Why?' at least 5 times to identify their core motivation. How does the experience you're creating with your product enhance or extend these feelings? Which of these hews closest to your average user's motivation? Which of these spurs them forward the most in their lives or means the most to them? Identifying this gives you a starting point in your business model creation. If your platform is connecting users to businesses as advertisers, or in some other way, you need to treat them as customers too and address their most urgent needs. This means you want to interview the businesses that might perform well on your platform as well. Figure out what they want to inspire in prospective customers. "For Strava, we ran interviews with businesses interested in interacting on our platform," says Quarles. "They were interested in us because they wanted to help people achieve their fitness goals. They wanted our members to see them as authentic partners in their fitness journey. And they wanted the value of their brands expressed by athletes rather than by themselves." Businesses that advertise are struggling in new ways these days. Consumers are generally tuned out from traditional ads no matter how they're repackaged. They don't come across as authentic, and millennial audiences in particular are allergic to being given the hard sell on sites and apps they use. To create a truly different product for these consumers, you need to get creative about where your users' needs and business partners' needs intersect. Stay open to a wide range of ideas that might meet both of their needs. Bring members from across your company into a jam/design session to figure out new ways to speak to users about businesses that will matter to them and authentically improve their lives. First, after interviewing users and potential business partners, go through an exercise to narrow ideas. Where is there actual overlap between their priorities? What needs are the same? Hone in on those few areas and ideas. Quarles has run interviews at both Instagram and Strava, and then urged his team to narrow and distill until they have a few action areas to focus on. 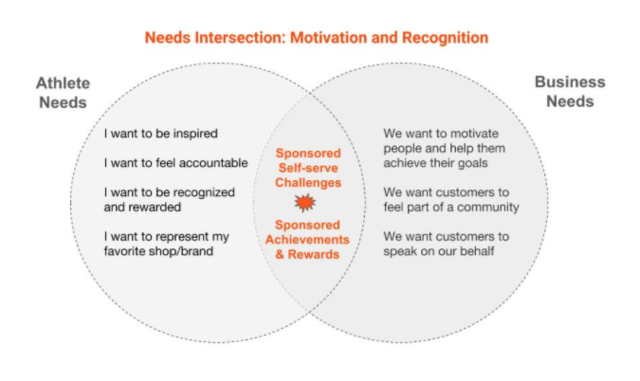 In the example above you can see how Strava has the opportunity to simultaneously support their community’s interest to be motivated and challenged with a sports brand’s desire to be a part of people achieving their goals. At the center of this intersection are several product ideas that the company will be testing in the coming months, creating more opportunities for achievement and reward in their experience. Strava's Metro offering is a key example of a revenue model that speaks to both the core needs of businesses and consumers. Introduced by the company’s founders in 2014, Strava|Metro is an insights platform that aggregates member-logged data from more than 300-million rides and runs annually to highlight route usage and help determine optimal placement of infrastructure investments. Strava licenses this data set to city planning departments around the world. In just four years, Metro has become the go-to tool for more than 130 government agencies and organizations looking to demonstrate the impact of bike lanes, running routes, and other new infrastructure. In doing so, it helps Strava deliver on its mission by making cycling and commuting better for its members while also growing an insights business line. "When we went through the exercise of identifying Strava's super powers, we saw that authenticity, our activity graph and data aggregations topped the list," says Quarles. "So our next task was to determine how to combine those aptitudes to deliver a better experience for our end users, simultaneously enabling businesses that could drive revenue for us." 2. Put your business model at the center of your user experience — not at the periphery. Where is participation the highest on your product? For Instagram, this was the home feed. What is your atomic unit? What's the action people are taking most? On Strava, it is the activity, a person’s run, ride or swim. What business model will create an even better experience for users in this part of your product? At Instagram, this was facilitating discovery of new products and small businesses. For Strava it could be discovery of activities that other members do. The most successful business models will live in this part of the product, use the same mechanisms, and can promote more use as the benefits become clear. Most businesses start their revenue tests outside the core experience in fear of slowing what is working so well. "The common fallacy is that monetizing will degrade user experience no matter what you do," says Quarles. "By pushing the way they make money to the side, they hope the tests will be less noticeable or invasive." More often they don’t gain enough traction to be meaningful and the results aren’t transferable to the higher volume locations. If, instead, you start in the central experience of your product, the results will be much more scalable over time. It will help you learn faster, because you'll have more audience to test with — and it will eventually push you to find the best, most durable product ideas because your bar is higher. At Strava, the atomic unit is uploading a fitness activity — that's what users do most often. Millions of activities are uploaded each day. Its subscription revenue model fits very naturally with this — as members stretch their fitness goals, they upload more activities, and look for the additional analytics and safety features in the paid version of the service. "There should be congruence between your business model and usage of your product," says Quarles. "Subscriptions, content, commerce, ads, insights — each of those models is best suited to very different ways that your product is useful to people." As Strava explores new business lines, it's taken the same tack of identifying what comes first for users. Strava has conducted a tremendous number of user interviews to understand their community members’ motivations are, not just in using the product, but in the concentric circles of their fitness goals and their daily lives. "We heard again and again that people want to be inspired, they want to be accountable, and they want to be recognized in the community that they have affinity with," he says. "In particular, they're looking to learn from other athletes who share their interests and favorite brands. They want credible sources for this information. As that becomes core to why they use Strava, it opens new opportunities for us to introduce them to products and services that enhance their love for running, skiing or swimming." 3. Prioritize the ideas that can scale to hundreds and eventually thousands of consumers and business partners. This advice is most relevant to consumer and small business focused companies, and it's absolutely critical to their success. As early as possible, make sure that your ideas have the potential for this kind of scale. It's okay if you need to spend time experimenting with things that don't scale in order to get there — but it should still be your North Star. For instance, when Instagram first incorporated ads into the feed, they found that they needed to condition the market a bit to rely on the visual to communicate their message rather than simply porting over text-heavy banner ads that had been designed for other digital environments. At one point co-founder and CEO Kevin Systrom would review every ad with the responsible team, primarily as a way to push them to be more intentional about the content in their Instagram ads. But the idea underpinning this discipline was that eventually objective best practices would emerge to make massive scale possible. It's important to note, Quarles says, that scale isn't just desirable because it leads to higher revenue. Rather, scale is a tool to continually and radically improve the quality of your users' experience with your product. If you view it through this lens, you'll be more motivated to get there, and see the advantages when you do. Scaling the number of businesses you work with creates rich diversity, which can maximize the relevance of your suggestions, thereby creating an even higher quality experience. Think about it this way: Instagram scaled both its consumer base and the number of businesses interested in advertising. The number of ad spots shown to each user did not go up, but the number and diversity of ads they could choose from to show to users did. This is what has allowed the company to show increasingly (now fastidiously) tailored and relevant ads to individual users. And, inevitably, that's what led to a random dad approaching Quarles to talk about how Instagram changed his life. If you do this right, you achieve a whole new plane of quality. Quarles has seen too many business handle scale the wrong way — because they aren't thinking about this progression and designing their experience accordingly. Google AdWords cracked the same nut, allowing many millions of small businesses to proactively spend their money 24 hours a day, ultimately powering a great combined paid plus free search experience for many millions more users. Make sure that scale is in the plan from the beginning, and that it's set up to serve quality. 4. Tap repeatable budgets that grow with value delivered. When working with advertisers and other revenue partners, be wary of "experimental budgets," says Quarles. This will inevitably come up as you pioneer your business model. You'll be tempted to work with partners who offer up large budgets to do awesome things on a very experimental basis. A telltale sign is how much they care about the press-worthiness or simply being first to do something. The problem is, they don't often repeat. Partners who like running experimental campaigns are often 'one and done.' They try something out and then move on to the next shiny object. They don’t measure the impact or ROI of their investment because it’s effectively disposable to them. And they won’t be coming back. Allocating time to these types of projects will not tap into a deep well of recurring revenue. Instead, your goal, when developing revenue streams, should be to make sure the value of your end users' participation is explicitly measured and increasing over time — that's what will keep them coming back and make revenue repeatable. It takes great discipline to not just take money from early customers. It is essential to confirm that your members value the additions to the experience and the businesses are able to directly compare how their spend on your service generates value versus other alternatives. "Gaming companies in particular have really nailed this," says Quarles. "Many of them give players the opportunity to pay in order to accelerate through stages of the game and make the experience even more fun and rewarding. Instead of having to wait a day for their next turn, they can pay a small amount and get to keep playing immediately." This is why allowing people to make in-game purchases that increase their enjoyment has been such a big moneymaker. Supercell, maker of smash hit Clash of Clans, used this model and became worth more than Evernote, Eventbrite and Buzzfeed combined. Performance advertising also scales up with the outcomes it delivers. "All businesses are looking for cost efficient ways to find new customers or generate leads for their new products. If you can clearly demonstrate you are generating new interest for them, even if it doesn’t directly lead to a sale, those businesses will allocate increasing portions of their marketing budgets to you." How can your company bottle this same magic? Quarles recommends surveying your end users to a) make sure they feel the value they're getting is on the rise as their participation increases (i.e. do you feel like your experience is getting better the more you use our product? ); and b) determine what value they'd want to see over time as they spend more time using your product or service — a great way to generate future ideas. All of this can be a lot to remember — and successful models will vary a lot across companies, depending on sector, consumer vs. enterprise, and stage of growth. Regardless of these nuances, whether a revenue model clicks depends heavily on the motivations of your users. Start there. Do the research and interviews to understand this backwards and forwards. Then, if you're working with advertisers or business partners, ask them about their motivations and needs too. Find the overlap and let that provide a helpful constraint for your creativity. If you can only remember a few other things from Quarles lessons, let them be this: the best model will be one that's repeatable, measurable, and always increasing value for your users. Most of all, resist the temptation to make your business model a peripheral or secondary concern. Make it the beating heart of your product, right there at the core — that's how you'll stay alive, and eventually thrive.